Revlon has a makeup collection called The Limited Edition Collection. It does not sound very catchy, but the products are. 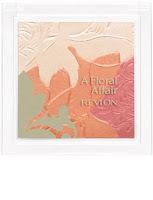 I bought two products from the it, A Floral Affair blush in peachy keen and Marble-ous Match Liner Shadow Duo in made for jade. You can recognize them both in the drugstore with the floral design. The blush is great and I usually wear it over my bronzer to give a little pink to my face. It is very sheer and has a light shimmer. The color is pretty and it lasts all day. This peachy product costs around ten dollars. The liner shadow duo works really well also. I apply it a little different than what is recommended. I put the bluish liner on my top lash line and I use the gold shadow for the corner of my eyes and underneath them. It works really well and I can wear it all day without it smudging. It costs around ten dollars and it has been my favorite eye makeup in a very long time. Enjoy!